Yin Yang Entertainment is an award-winning Wedding Band serving the central belt of Scotland and beyond, they contacted me through a friend. They took advantage of my free one-hour consultation. After displaying my worth and value in the free hour I was commissioned to upgrade their website, update and advise on their current use of social media. The key things for the website were making it responsive, fast and easy to interact with. The website also had to be loaded with relevant media (video, and audio of the band) to give prospective customers a real flavour of the bands quality and finally it had to have clear links to their Facebook events and booking forms. 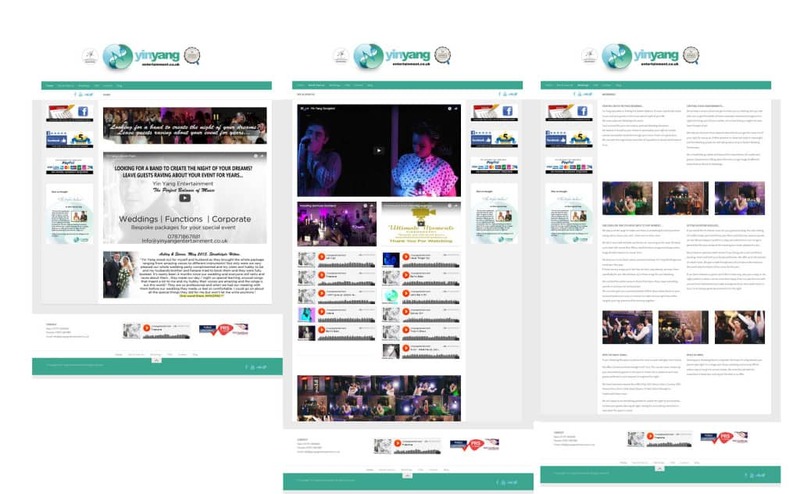 The social media sites used by Yin Yang Entertainment were Facebook, Twitter and Youtube. The main social channel was Facebook which is heavily utilised and integrated into the website as this is the platform the band use to drive most of their customers. Here I made some key adjustments in settings, as well as sharing my experience, tips and tricks of the Facebook platform to drive short term engagement.